Black high top Converse “Chuck Taylor” All Stars. No egg bottoms here, these shoes have real sole! Never, ever would I wear them! They were simply anathema. In 1976 at Greenville (Mississippi) High School no self-respecting male would ever be caught wearing egg bottoms. No way, no shape, no how! The thought of wearing egg bottoms still sends a shiver down my spine. 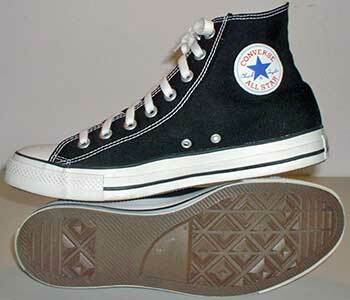 Now Chuck Taylor Converse All-Stars — there was the shoe — especially the high-top variety showing off the star. “Stars” as they were known were absolutely the height of fashion in shoe wear of my day — the haute couture of the seventies Mississippi Delta. Egg bottoms were the complete antithesis. As best I recall the name “egg bottoms” was derived from the shape of the tread on the bottom of non-Stars tennis shoes. Someone once commented that some of the suction-cupped tread was shaped like an egg and the name stuck. So did the shoe. Never was this more hilariously apparent than one fine day in gym class. It was the dreaded high jump day. To truly understand this story you must know that Greenville High School was far from the cutting edge of gym technology. Instead of having a bar for the high jump we had a rope tied to two poles. But still for most of us — especially those of us wearing Stars it was no problem — even if we did not want to do it. But for a classmate who happened to not being wearing Stars it was a completely different story. The scene is as clear to me as if it happened yesterday. Chris begins his approach to the bar, I mean, rope. . .he plants his foot to jump. . .the crowd quiets down in anticipation . . and his egg bottoms stick! They stick just for a second but it was enough. After a loud popping noise they become unstuck and he falls headlong into the rope and the bars come crashing down on top of him. The entire gym erupts with shouts of “egg bottoms” and uncontrollable, prolonged laughter. The next day I believe I spotted Chris wearing Stars. That is why to this day you will never see me wearing egg bottoms. Tennis shoe technology has come light years since the seventies, but Chuck still rules the feet. Regardless of the brand now though, turn over a tennis shoe today. One thing you will not see is egg bottoms. I think Chris may have gone on to work in the tennis shoe industry. Last week my four-year old daughter, Taylor, came home from a shoe shopping trip with mom. You cannot imagine how my heart swelled as she showed off her new purchase. 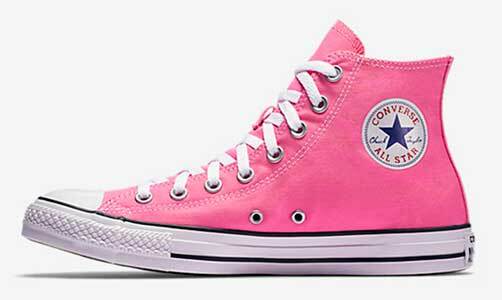 It was the loveliest pair of pink, high-top, canvas Chuck Taylor Converse All Stars I ever saw. She had never heard of egg bottoms, but my gene-pool had to have been at work. Somewhere in the back of her mind she knew amid all of the choices only Stars would do. She sure did her old dad proud. Pink high top chucks are a core model. If you have a personal story about Chuck Taylors to submit to this website, please contact us at mail@chucksconnection.com.